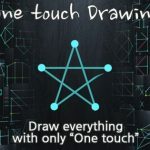 One Touch Drawing is a simple puzzle app that’s not just fun, but free as well – a pretty ideal combination, if you ask me. 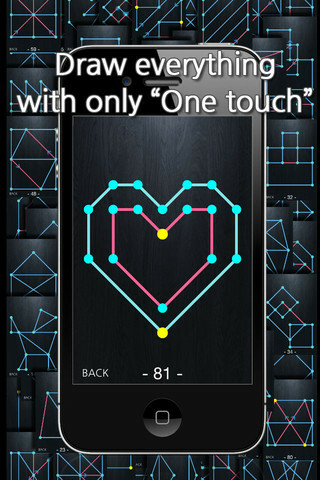 In the app, you are faced with 2D diagrams consisting of straight lines, divided at vertices by big dots. 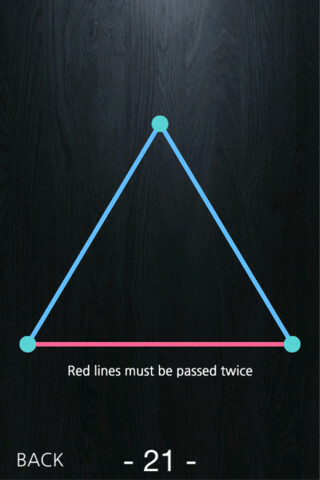 Your job is to navigate your finger around the lines without letting go of the screen, making sure that you go over each line segment without drawing over any segment twice. Each level presents you with a different diagram, with 120 levels in total. The difficulty of levels increases fairly gradually as you progress through the game, although there are occasional jumps (and abrupt declines) in difficulty that can be frustrating. If you get stuck on a level, you’ll be given a hint after incorrectly guessing what the solution is 10 times. The hints provided simply tell you which vertex of the diagram to begin tracing from. This can be very helpful, although some might find that it’s still not enough to help them solve a level. To keep the gameplay fresh, new elements are introduced at various points. 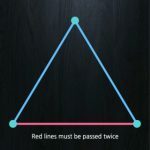 Although they are small additions, things such as lines that have to be passed over twice (rather than once) and lines that can only be passed over in certain directions really help to keep the momentum of the game going whilst adding to its difficulty. If you do get bored of the main game mode, there’s a survival mode for you to take on as well. It’s essentially the same as the main mode, except you have to get through as many levels as you can without failing at all. That is, if you draw a diagram wrong once, your score drops back to zero. Although it’s nice to have another gameplay option, survival mode is nothing special and I can’t see many players spending too long with it. 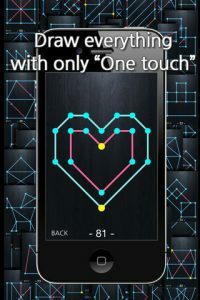 Just as the gameplay mechanic is simple, so are the app’s visuals. They’re nothing remarkable, but are definitely more than adequate. The audio is fairly shoddy – tinned applause sounds when you complete a level – but you can always turn it off and it won’t impact on the gameplay at all. 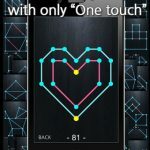 Overall, One Touch Drawing is a simple, engaging app that’s great for puzzle fans. Its ads are entirely unobtrusive, but if you’d rather do without them, you can also upgrade to an ad-free version of the game for just 99 cents. Check out our reviews of the Logo Quiz Game, Shark Dash and our feature on Draw Something!